Commenting Deirdre Naughton, Midwifery Practice Development Coordinator at Portiuncula University Hospital said, “We want to facilitate the opportunity for the women who use our service here in PUH and the staff that provide it to come together in an informal and relaxed way and talk about their experiences. 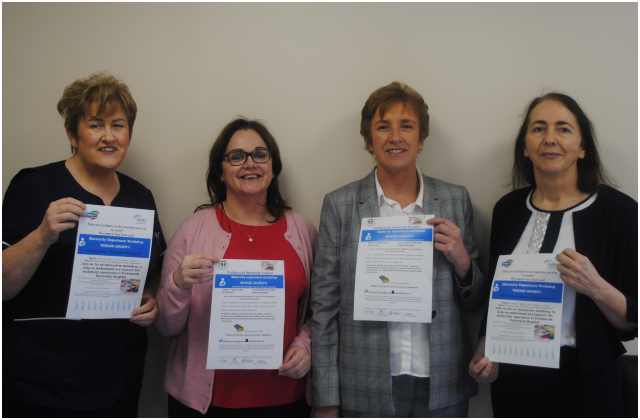 The Whose Shoes format has worked very effectively in other maternity services both in Ireland and the UK and provides really important feedback to maternity service providers on how they can better understand an improve the service they provide women and families. “We are holding this event in Ballinasloe on Friday 01 March and we would be delighted if women who attended the unit here in PUH or are currently attending it would come along. We hope the ideas generated at this workshop will help us plan and further improve the service we provide”. Maternity Unit staff at Portiuncula University Hospital are inviting former and current patients to an information sharing event in Ballinasloe on Friday 01 March. From left: Anne Murray, Clinical Midwife Specialist in Neonatal Resuscitation; Deirdre Naughton, Midwifery Practice Development Coordinator; Mary Burke, Clinical Midwife Manager 3; and Anne Regan, Assistant Director of Midwifery.